This is a very exciting and personal family recipe for me to share so consider yourselves lucky! My mom and I tried to reproduce this stuff off-season a few times and always failed. Soupy rice or a mushy mish mash, we just could not get to that perfect rice we always have around Christmas time. So a few weeks ago we invited Auntie Debbie over to complete our baked rice mission. She had learned this recipe many years ago from her grandmother and it felt pretty special for me to finally know the secrets to making this baked rice. Enjoy! Preheat oven to 350 and generously butter a glass 8x8 dish. Start by adding water, salt and rice to a medium sauce pot. Stir and bring to a boil. Once at a boil let the rice cook for 4 to 5 minutes, keeping it a little al dente. Add more water as needed. 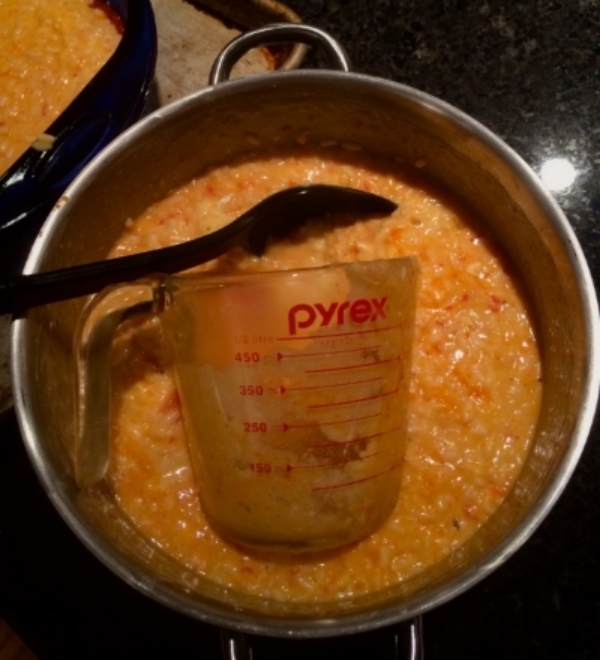 You don't want it to get too dry-- it should resemble the consistency of a thick oatmeal. Meanwhile, mix the shredded chicken, frozen peas and few spoonfuls of sauce to coat the mixture. Remove rice from burner and add 6 tablespoons of butter to the cooked rice and mix to incorporate the butter. Next add 1/2 cup of grated cheese followed by beaten eggs, making sure to mix them in completely. Lastly, add a spoonful of sauce to your rice-- just enough to turn the rice a pinky-salmonish color. Now we layer! Make a light layer of sauce in the bottom of your pan. Add the rice to fill half way being sure to push it all the way to the sides. Add the chicken and pea mixture, 1/2 cup of cheese and layer the rest of your rice on top. Top off with a very light layer of sauce. Sprinkle remaining 1/4 cup of cheese, breadcrumbs and the last 2 tablespoons of butter on top. Bake till golden and bubbly, 35-40 minutes.